26 December - 5 Dianella Dianella revoluta, and 4 Native peppercress Lepidium pseudohyssopifolium planted halfway down track from Chris Cross garden centre car park, and 6 Goodenia ovata on bank towards Burke Rd. Slashed open area north of track (b/w trees and on slope not done by contractor), and followed up previous spraying with 16L of glyphosate (12ml pL) on trad, kikuyu and blackberry in this area. 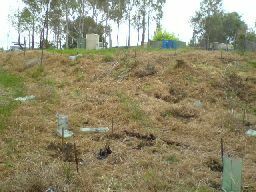 A number of old tree guards removed from around medium trees and from unsuccessful previous plantings in grassland area (F5 - F6). Approx 2 hours work. and an open area north of access track from Chris Cross car park. Is this the site for a picnic table/shelter? 25 November - Approx 25 Kangaroo Apple Solanum lanciniatum, planted along embankment on north side of Chris Cross garden centre car park, and 14 Goodenia ovata on south side of track. A number of old tree guards removed from around medium trees and from unsuccessful previous plantings. Approx 2 hours work. 15 November - Approx 40 Kangaroo Apple Solanum lanciniatum, planted along track (north side) near Chris Cross garden centre, and gave the previous plantings a drink (courtesy of Chris Cross tap). Plantings from 2/11/07 still looking OK. 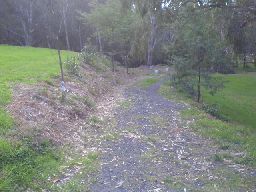 Removed one tree weed along the Chris Cross track. Approx 2 hours work. 8 November - Sprayed 30 litres of glyphosate 360g/L diluted at 10ml /L near Chris Cross garden centre (D7 - D8) on Kikuyu and Trad with a bit of blackberry. 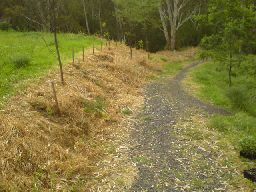 Removed number of tree weeds, Pittosporum undulatum, Pinus radiata, Tree lucerne, Hawthorn, Fennel in C2, D2 - D3. 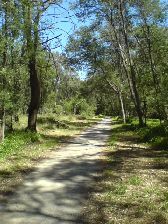 Reasonable recruitment of Tree violet and wattle in this area. Approx 2 hours work. Plantings from 2/11/07 looking OK after heavy rain on 4/11/07. 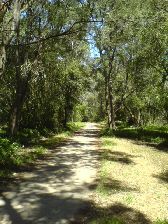 2 November - Approx 40 Kangaroo Apple Solanum lanciniatum, 10 flax lillies Dianella revoluta, and 3 Goodenia ovata planted along track near Chris Cross garden centre. Soil was not what was expected - lots of rock, stones and concrete with little actual soil. Soil was dry, but after one quarter average rainfall for October and one third in September, this was expected. 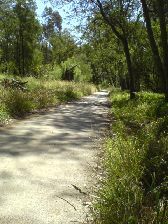 The track from Chris Cross in April 2008. Early October - Cuttings of Rapanea howittiana taken and 35 planted in a hyco tray - previous cuttings had dried out . Cuttings of Goodenia ovata taken at Willsmere Billabong and 90 planted in a hyco tray. 35 Cuttings of Gynatrix pulchella taken at BRB. Another 45 Cuttings of Lepidium pseudohyssopifolium taken at BRB. Area along track below Chris Cross (map D7) sprayed with 1% 360 gpl Glyphosate. Labels made for tree guards for future plantings. 40/45 Cuttings of Lepidium pseudohyssopifolium have rooted. Gorse bush in NW area on river bank (map C3) removed. Sunday 26 August 2007 - Cuttings of Lepidium pseudohyssopifolium taken and 45 planted in a hyco tray. 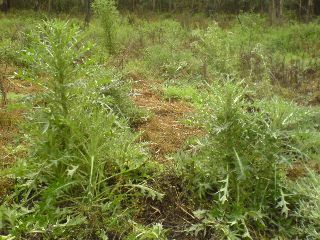 Two boneseed plants removed in 'Pastoral Woodland' on western boundary and some spear thistles in the dry billabong. 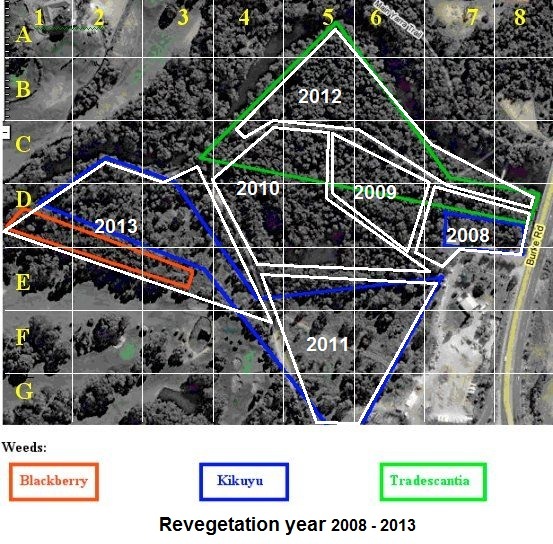 Monday 13 August 2007 - Nature Links sprayed blackberry in 'Pastoral Woodland' on western boundary. Nature Links collected some Lepidium pseudohyssopifolium seed for propagating. Coprosma repens near car park cut and painted with 50% glyphosate (360 gpl) mix. A number of other hawthorn trees, boneseed, solanum pseudocapsicum cut and painted or removed. 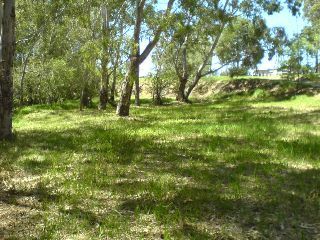 A large number of spear thistles in the dry billabong grubbed out. One was 1.8metres and ready to flower. Early August 2007 - Picked up approx. 120 wire tree guards w/plastic from Darebin Park. 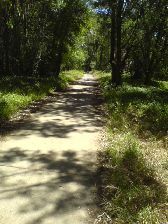 Some more may be available but need to see whether tree guards are needed at Billabong - there are no signs of rabbits and the billabong looks like good fox country which would control rabbits. May - August 2007 - Cuttings of Kangaroo apple taken from Herring Island for planting at Billabong as initial weed control plantings. Poor strike rate with May cuttings meant only about 20 of 150 survived. Approx 50 cuttings made in August.